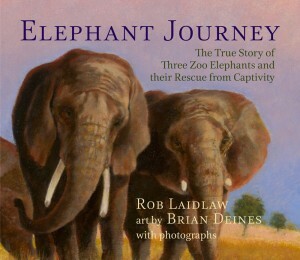 Elephant Journey: The True Story of Three Zoo Elephants and their Rescue from Captivity, written by Rob Laidlaw and Illustrated by Brian Deines, has been nominated for the Hackmatack Children’s Choice Award. Elephant Journey is an account of the road travelled by Toka, Thika, and Iringa, three African elephants, from the Toronto Zoo to the Performing Animal Welfare Society sanctuary in California. The Hackmatack Award is Atlantic Canada’s reading program for students in grades four to six. Participants will read a shortlist of ten fiction books and ten non-fiction books in either English or French, then vote for their favourites. You learn more at the Hackmatack Award website. In 2014, No Shelter Here: Making the World a Kinder Place for Dogs, also by Rob Laidlaw, won the Hackmatack Award in the English Non-Fiction category. Its sequel, Cat Champions: Caring for our Feline Friends, was nominated the following year.